If you notice your kitty scratching fervently, she may suffer from irritated, itchy skin. To soothe your kitty's incessant itching and provide her with relief, you need to first deal with the underlying cause of the itching: Bring her to a vet for a proper diagnosis. 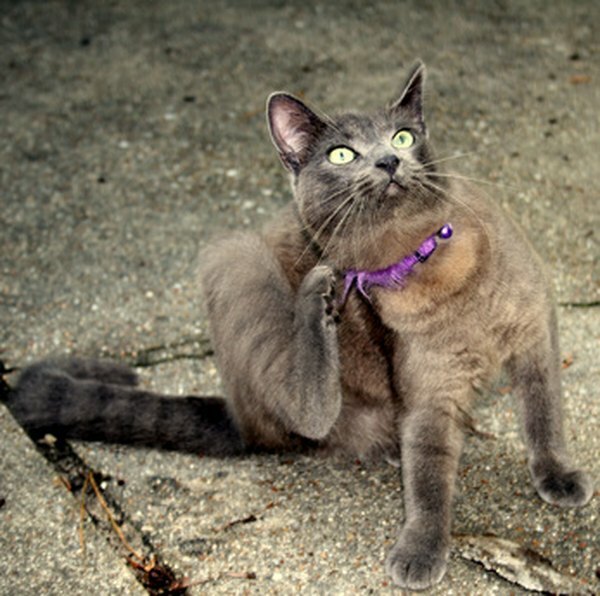 According to the Cat Channel website, fleas and other external parasites are the primary cause of itching in cats. Fleas -- along with different types of mites, ticks and lice -- can infect your cat's skin, causing infections, itching, scabs and hair loss. Bacterial and fungal infections, such as pyoderma and ringworm, also cause itching. These infections can occur alone or as a result of continued scratching due to an external parasite infestation. To properly diagnose the condition behind your kitty's itching, your veterinarian must give the cat a full physical exam and take skin scrapings or samples. 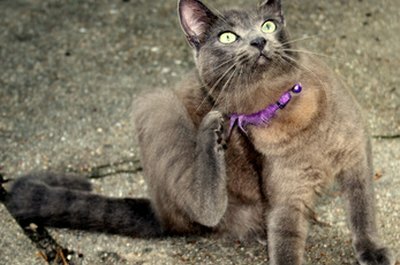 Once you determine the cause of the itching, you can treat it and eliminate it, giving your cat her much-needed relief. To treat itchy skin due to an infestation of fleas or other insects, the application of a topical flea preventative medication can help rid your furbaby of these pests. These liquids are rubbed between your cat's shoulder blades. Substances like selamectin kill fleas, ticks and certain types of mites, according to PetPlace.com. In addition, bathing your cat in anti-flea shampoos or using antiparasitic dips can quickly eliminate the pests from your cat's skin. For cats with skin infections, you can apply either topical antibacterial or anti-fungal medications to your kitty's skin, depending on the cause of the infection. Both oral medications and topical ones provide your cat with relief from the bacteria or fungi causing the skin irritation. Before administering any medications to your cat, always consult with your veterinarian, who will give you proper dosing information. If your kitty has a clean bill of health but suffers from continued itching, a change in her diet may be in order. Food allergies are a common cause of itching with no other explainable cause, according to the Feline Advisory Bureau. To treat food allergies, your veterinarian will put your cat on a hypoallergenic diet containing a very small amount of ingredients, including an unusual protein like duck or venison, according to the Vet Info website. In this way, if your cat shows signs of improvement in her itching while on the diet, a food allergy can be diagnosed. After eating the hypoallergenic diet for a period of time, ingredients are slowly added back into the kitty's diet one at a time until the culprit behind the itching can be determined. If a food allergy, external parasite, skin infection or other medical cause, such as an autoimmune condition, have all been ruled out, a contact or environmental allergy could be to blame. Treating such an allergy is difficult, especially if the cause is unknown. For cats with allergies, antihistamines can be prescribed and administered to alleviate the inflammation and itching caused by allergens. Let your vet know if your cat shows any signs of drowsiness or excitability while on antihistamines. Some cats may exhibit signs of itching while being treated for a curable skin condition, scratching fervently and slowing down the healing process. To soothe your cat's itchy skin during treatment, apply a veterinary cortisone cream to the skin. Your vet may also prescribe oral steroids, such as prednisone, to reduce inflammation and itching. To alleviate your cat's itchy skin naturally, you can supplement her diet with fish oils containing omega-3 or omega-6 fatty acids. These substances help combat aracadonic acid in your cat's system, which causes inflammation, and they improve her skin's hydration. Fatty acid cat supplements are available through veterinarians and in pet supply stores. Encourage your cat to drink plenty of water if dry skin is causing her itchy skin, by changing her water several times a day so that it is always fresh. Wash her with a gentle shampoo containing colloidal oatmeal to soothe her skin. You can make a natural tea out of sprigs of fresh catnip and apply the liquid with a cotton ball to your cat's skin to relieve itching, or bathe her in it. Natural tinctures made with dandelion root applied to the skin can also help with itching, according to WebMD.